Tribotechnical compound "MOTOTEC 4" restores worn parts and protects metal surfaces in friction assemblies from wear. Application of the compound reduces the friction losses, increases power, reduces fuel consumption, noise and vibration. in crank mechanism – in the bearings of the crankshaft in particular. If the gear box is in the same oil pan as the motor, the compound will also treat all gear box elements: surfaces of bearings and gears. At the same time, the compound does not interact with friction clutch, does not change its characteristics as it is made of composite materials. The compound is designed to restore the performance and protect against wear the four-stroke engines of motorcycles, all-terrain vehicles (quad bikes), snowmobiles, personal watercrafts and other motor vehicles. The greenish sediment on the bottom of the can is the main working element of compound «MOTOTEC 4» - these are microparticles of minerals. It is strictly important to thoroughly stir the contents of the can before pouring it in the engine oil system (sediment color depending on the release batch can vary from light green to dark gray and black). 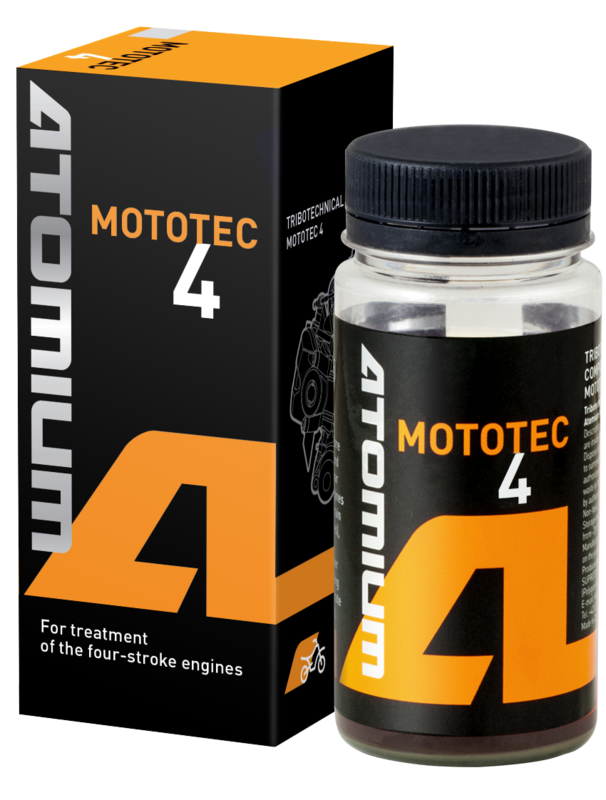 Compound «MOTOTEC 4» does not interact with friction clutch and does not violate the clutch operation. To provide continuous level of protection of the engine it is recommended to apply the compound further after each oil change in the engine. 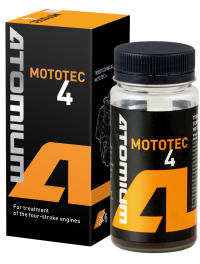 Compound «MOTOTEC 4» is compatible with all types of fuel and oil. Overdose of compound by 2-2.5 times is not dangerous for the engine and does not disturb its work. Compound «MOTOTEC 4» does not affect the characteristics and status of parts made of composite materials and rubber. Stir the compound thoroughly until natural sediments (active components) are totally dissolved. Apply the compound through the regular oil filling neck. Apply ½ of the can only – if engine volume is less than 500 cm3. Apply 1 can – if engine volume is more than 500 cm3. Start the engine immediately after the procedure.